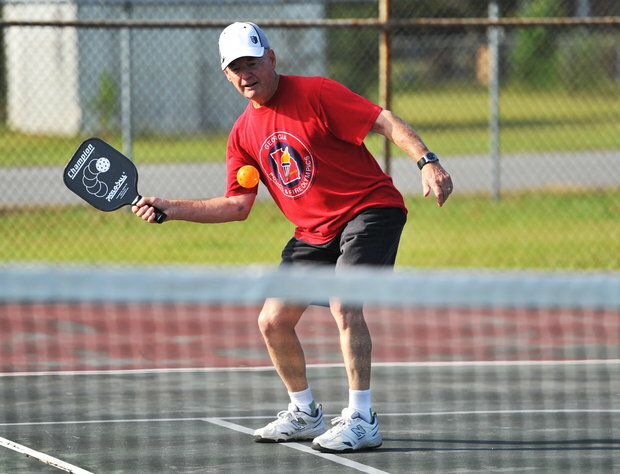 WARNER ROBINS -- A cross between tennis, ping pong and badminton, pickleball is the newest sport at the Georgia Golden Olympics. Played with a large paddle and a ball with holes of varying sizes, opponents serve and volley much like tennis. William and Sheila Slye first started playing eight months ago while living in Winston-Salem, N.C. The Bonaire residents liked it so much, they bought their own graphite paddles and decided to participate in the state games for the first time.